Choosing the most appropriate color for your new or newly remodeled kitchen is often one of the most difficult design choices you’ll make. After all you want a color scheme you can love, one that is both trendy and stylish, but also timeless. Do you go for white with pops of color? Or do you opt for neutrals or modern or exotic? Does nature inspire? Or would you prefer a streamlined or industrial look? Let’s explore the options and help you decide the perfect kitchen color for your space in 2019. White Never Goes Out of Style? While true white conjures up images of clean, simple, and pure, it is not often the perfect choice. Of course, the palette shades of white offer many options which can soften and enhance the appearance of your kitchen and allow you to incorporate pops of color to create your own modern style. If white seems a bit too pristine for you, modern neutrals may provide the answer you seek. Gray and taupe are both natural and refined, and pair well with today’s popular accents of dark woods, rough-hewn wood, and natural stone. Gray and pearl offer a sophisticated combination, while gray combined with wood and black deliver a modern twist. These timeless neutrals also pair well with black and deeper jeweled hues which are popular choices in the 2019 kitchen. An unexpected new neutral for 2019 is sage which works well with both creamy tones or dazzling whites. Sage can also be easily paired with deep browns and other woody tones like oak and cherry. Adding brighter colors is an ideal choice for spaces with lower levels of natural light. Shades of yellow are warm and can easily brighten the space. 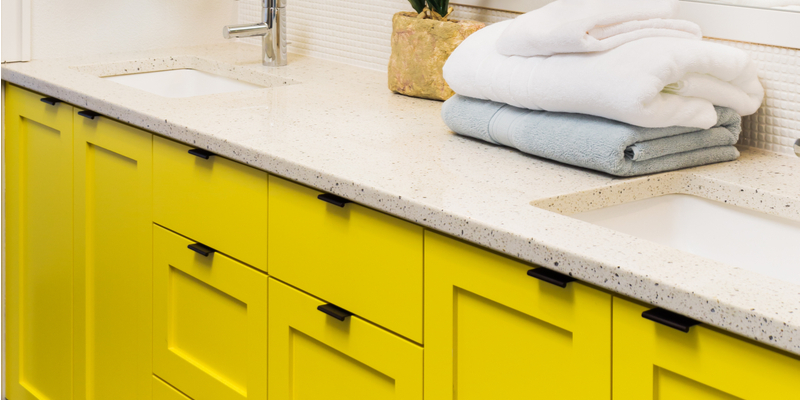 Yellow can be paired with classics like blue or brown, but also energizes your kitchen when paired with other citrus colors like orange and lime green. These colors have also been shown to elevate feelings of peace and happiness, welcoming guests into your kitchen. These fresh exotic hues deliver a stylish contemporary look for your space. Consider pairing one of the bright citrus shades with white for a fresh, clean look that brightens the space, making if fun and trendy at once. Limit your vivid pops of happy colors to one or two choices, accenting without overwhelming your kitchen space. Red was once a popular choice in home kitchens, but fell out of favor in recent years, only to make a comeback in 2019. While a bold choice, red is known to stimulate the appetite making it a wonderful option with which to accent your kitchen. Red tones pair beautifully with stainless steel and wood cabinetry and won’t overwhelm the space. Red also works well with white and gray, to make a warm and welcoming kitchen space. Blue and Green – Yes! Deep tones are still popular – especially navy blue or duck blue – though blue has not always been the darling of kitchen color palettes. But both blue and green can bring refinement with a soothing touch, perfectly suited to kitchen design. They pair well with wood tones and whites, and work well in kitchens with an abundance of natural light. Bright hues like turquoise, lime, and apple, bring a measure of fun and energy to the kitchen. If bold, deep tones or vivid hues seem a bit much, but you still want blue or green for your space, consider the popular sage as well as the gray-toned greens and blues of 2019.